If you have ANY form of chronic pain… whether it’s joint pain, muscle pain, tightness, stiffness, or full-blown arthritis this is great news. And he knows how desperate and frustrated you can get when you invest your time and money looking for answers… and STILL come up empty. He moved beyond the fear and frustration… the drugs and surgery… and the so-called solutions that only provide temporary relief. 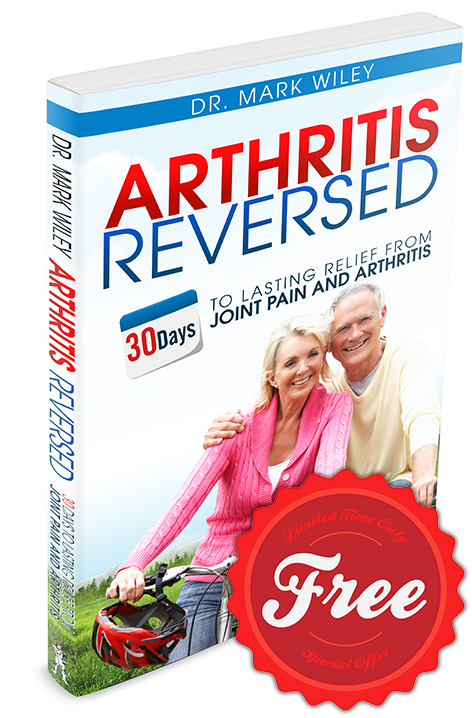 In Dr. Wiley’s book Arthritis Reversed — which is yours FREE — you’ll discover ideas, insights and techniques your doctor has probably NEVER heard of… simple techniques you can use together to quickly and effectively eliminate your pain. To really give you that shot at life-changing, lasting relief, Dr. Wiley shows you the deeper causes of your pain… which most doctors completely overlook. How to Give Your Body a Diagnostic Check Up: To see where you may have too much of something (like excessive glucose, or too many diuretic beverages)… too little of something (like a deficiency of water, healthy fats, or thermogenic spices)… and where you’re experiencing “stagnation,” (like a buildup of toxins, or lactic acid). What Doctors, Chiropractors and Massage Therapists Miss: The impossibly tight, “contraction knots” that develop in muscle and tissue when an area of the body is stressed, “frozen,” injured or overworked… and how to release and relieve them with an almost unknown therapy designed specifically for people with arthritis and chronic pain. I asked him to think about people like YOU who are feeling stuck, frustrated and ready to pull their hair out because everything they try turns out to be a dead end… or at best, a partial, incomplete attempt and getting a few minutes of pain relief. I have the answers in my hand… and now I’m turning them over to YOU. But you need to act right away…when the FREE copies are gone, they’re GONE. P.S. — This book is so easy to use, you’ll have dozens of new options can use right away. And here’s something I didn’t tell you… Dr. Wiley included a super-easy 30-day action plan that makes it impossible to fail. So even if you thought your case was too complicated, or too “different” for something like this to work… I have great news. Everyone I know who uses Dr. Wiley’s method gets relief. I honestly don’t know a single person who’s missed out.